This is a total possibility and leads to the ultimate freedom and happiness all you have to do is adopt an abundance mindset instead of a scarcity mindset. When you have an abundance mindset you believe that there's always more of everything in life, whether that's money, relationships, resources, opportunities, etc. On the flip side, if you have scarcity mindset you probably live in a lot of fear. Fear of losing. Losing in love, work, time, money etc. If you are riddled with fear on a regular basis then you need to develop an abundance mindset. Yesterday I was talking with one of my clients, let’s call her Rita. Rita just went through a break-up and was worried that she would never find love again. She talked about how she had decided that he was the one for her and she was all in. How the scarcity mindset can unconsciously guide your life. "But why?" I asked because I knew this had been a very tumultuous relationship for her and I was curious about the stories she was telling herself. What we discovered was that it wasn't that she was “so in love with him,” that's just what she was telling herself about why she was so sad the relationship was over. It was actually because she was holding on tightly to a scarcity mindset that caused her to believe that she would never find true love. 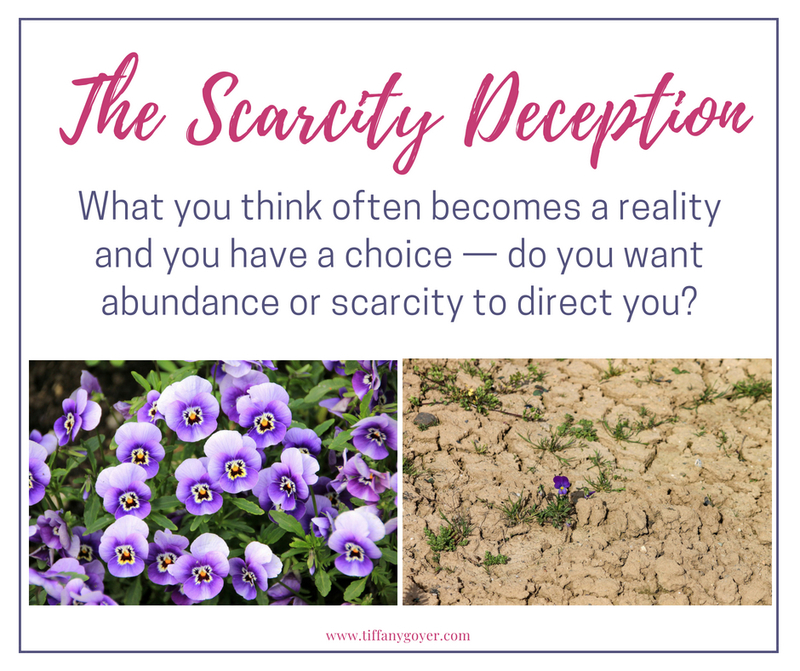 The scarcity deception — what you think often becomes a reality and you have a choice — do you want abundance or scarcity to direct you? We talked more about her relationship history. What we discovered was that she stayed in this relationship (and others before) because she was worried that the relationship was her only chance at love and if she gave up on it, she may never find someone to love again. She was dumbfounded to realize how scarce she had actually felt. She hadn't even realized that she was thinking this. When we questioned the validity of this thought she realized what a lie it was. But meanwhile, this thought had created so much fear for her that she would stay in unhappy relationships over and over again for fear of not finding anyone else. There really are plenty of fish in the sea, Rita exclaimed! Midway through our 12 coaching sessions together Rita had this revelation. Soon after she was dating like nobody’s business and when she found herself without a match, she would move on to the next date very easily instead of trying to make one work that wasn't working because she believed in abundance. By the end of our work together she was so elated because she met someone that she felt a deep connection with. She told me that she always dreamed this was possible but she just couldn’t get herself to believe it because she never experienced it. The secret to having it all is believing that you already do. Furthermore, she about tripled her income during our work together! I was so happy for her! ❤️ Prior to that, she had money scarcity up the wazoo. This is very common and can feel like a taboo subject but it's something that needs to be talked about and looked at if you desire monetary abundance. You need to know what your current beliefs about money are and if they are even serving you anymore. I will speak about this in another blog soon. Believe it is possible before you take action. The reason she was able to get so much traction with relationships and money during our work together is because we did a deep dive into her then current thoughts and she decided on purpose what she wanted to believe and then she started to live as if her goals of having a great relationship and more money were already happening. She believed it was possible and took action from that place. And guess what, it was possible! And you can do this too. I'd be honored to teach you. It’s no secret that mindset can dramatically change the course of your life. Heaps of research has shown that the way you think about yourself and the greater world around you can alter the way you learn, handle stress, create success, your ability for resiliency and even how your immune system functions! If you are holding yourself back from opportunities because of scarcity in any area money, relationships, career, opportunities or in life in general, I urge you to get cracking on cultivating an abundant mindset. This is not woo-woo this is science. Just notice this week when you are in scarcity and when you are in abundance. Is there a specific area you struggle with, maybe it’s money, or relationships, or something completely different? Identify the area or areas that are difficult for you. Are there any themes you notice? In what ways can you observe how scarcity may be holding you back? Are there anyways that you are currently abundant in your thinking? What areas? Why is it easier for you in this area? Can you use that meta-skill to apply it to other areas of your life? In what ways do you notice that abundance keeps you strong, motivated, alive and living to the fullest? How would your life look and feel differently if you adopted an abundance mindset? If you do this work I can guarantee you'll be feeling so much better about life in a New York minute and the outcomes that you desire can absolutely happen. It’s so exciting. Some of my clients and students get really upset around this topic because they realize how stuck in scarcity they are. If that's you please don't fret. It’s something you totally have the ability to change by learning to change your thoughts. Connect with me for a mini session and I will teach you how to get started today. Newer PostAre You Repeating the Same Old Patterns? How to Stop!